Martha's Vineyard island's most interesting historical museum is in Edgartown, housed in several ship captains' houses from the mid-1700s. The Martha's Vineyard Historical Society (tel 508-627-4441), 59 School Street at the corner of Cooke Street in Edgartown (map), owns several historic houses now constituted as the Martha's Vineyard Museum. The Society's headquarters is the Captain Francis Pease House at 59 School Street, featuring changing exhibits. Nearby is the Thomas Cooke House (1760s), furnished with artifacts that have been brought here from Vineyard houses, including scrimshaw, china, glass, paintings, and nautical paraphernalia. In other buildings on the grounds, various types of boats that played a part in the island's history can be seen, and there's a special tower to hold the Paris-made lens (1854) that revolved in the Gay Head lighthouse from 1856 to 1952. The museum is open from mid-June to mid-September, 10 am to 4:30 pm, closed Sunday and Monday. 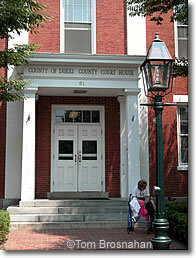 County of Duke's County Courthouse, Edgartown, Martha's Vineyard MA.